The Korilla Hose is a very tough flexible high pressure hose that is successfully used with Lubecore hose inserts and stainless steel crimp style clamps in the installation of automated lubrication systems. Korilla Hose is especially beneficial in areas where there is a lot of movement of the lubrication points or where hoses are exposed to such things as rocks being thrown up from the road. A typical application is where a normal polyamide nylon tubing is not holding up or is causing a large amount of maintenance to repair or replace the lubrication system hoses. 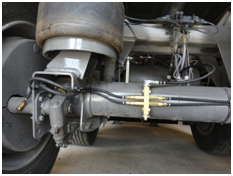 The Korilla hose / Lubecore hose insert combination saves time and money during the original installation of the lubrication system. It also allows a mechanic to make a quick and clean in the field repair to a lubrication system hose and does not require special tools or crimping equipment to do so. The Korilla hose is very flexible which makes it easy to run lines where needed. The stainless steel crimp style clamps can be crimped with standard tools.